The main results and findings of the REFLEX project will be published in different ways. On the one hand, short policy briefs will be prepared to publish scientifically-based findings, which are relevant for energy policy. In order to provide detailed and highly sophisticated information on the different topics addressed in REFLEX, short project reports with the most interesting results will be prepared. In addition, scientific articles in journals an conference contributions will be published. In contrast to the other two ways of publication, these aims to present more theoretical and methodology related topics of the project. A large part of the modelling activities in REFLEX is determining which technologies will see increased diffusion, and which technologies will be phased out. A key consideration of modelling the transitioning layout of the European energy system is how the costs of incumbent and upcoming technologies will develop in the future. Technology costs can decrease through a variety of mechanisms, mainly learning-by-doing, learning-by-researching (R&D), product upscaling (larger products) and production upscaling (larger production facilities). Using experience curves, one can estimate the future costs of a technology, given some exogenously derived development of cumulative production. 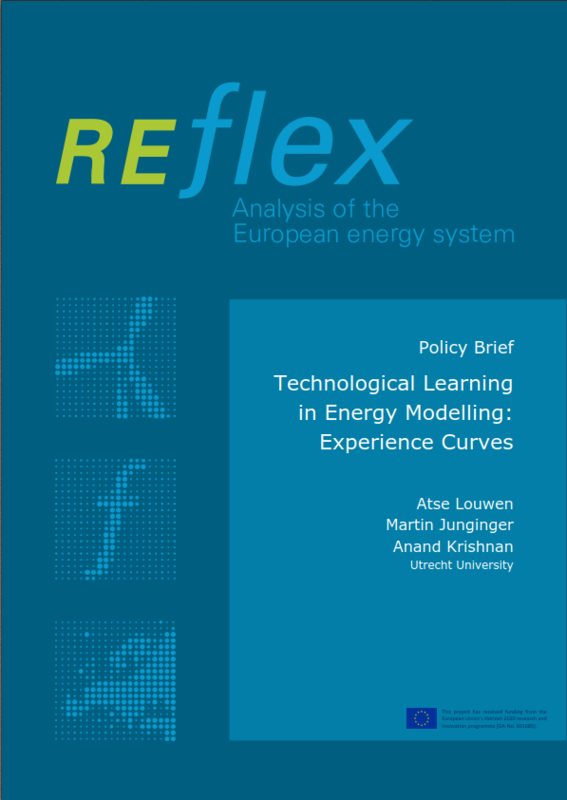 In this policy brief an overview of experience curves and their learning rates for different renewable energy sources, batteries and other low-carbon technologies is provided. Furthermore, cost extrapolations for selected technologies are conducted and policy recommendations are formulated. 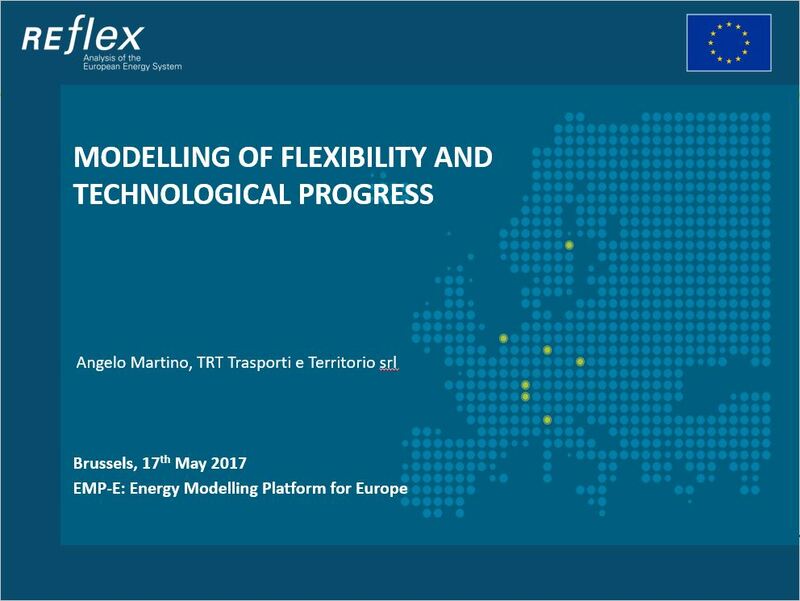 Aside from the application within the REFLEX project, the results of this exercise are themselves valuable for researchers, policy makers and other stakeholders, since accurate cost trends and outlooks for energy technologies are valuable information in the context of the ongoing transition towards a sustainable energy system. With the increase of intermittent renewable electricity generation, the need for flexible demand side appliances and technologies able to support a reliable and stable electricity provision to final consumers is expected to grow further. For the services sector only a few theoretical evaluations on Demand side management (DSM) are available and in addition the empirical data on the effective participation of companies in DSM schemes is scarce. The policy brief discusses methods and results of a qualitative stakeholder survey aimed at understanding DSM barriers, thresholds, potentials and drivers, as well as designate options to implement DSM measures. The survey results show that favourable regulatory conditions, such as in Switzerland and UK, are not sufficient to establish functioning DSM markets and attract companies’ interest. As of today, particularly small demand units from services sector companies are hardly participating in DSM, although on aggregate level their DSM potential would be high. Lack of (reliable) information and of financial benefits as well as perceived risks seem to be relevant barriers against the adoption of more DSM option in the tertiary sector. How to balance intermittent feed-in from renewable energies? In future markets with increasing shares of renewable energy sources (RES), additional flexibility is needed to maintain system reliability. Therefore, flexibility options are required to balance intermittent feed-in from RES plants. 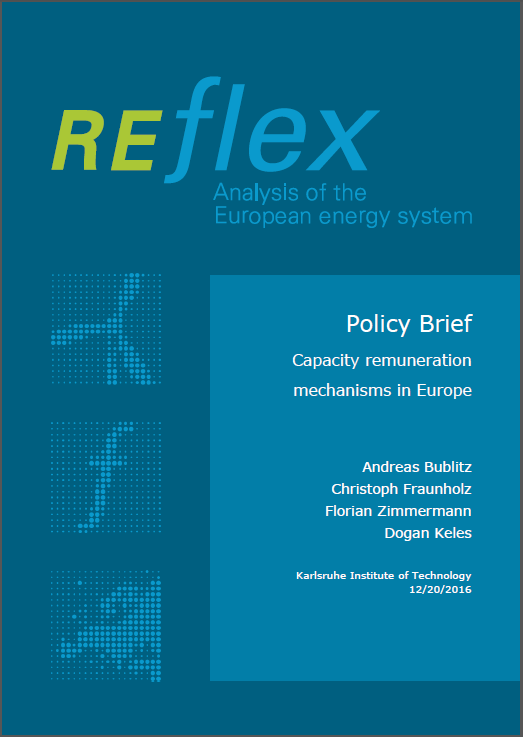 The policy brief provides a structured overview on flexibility options for system integration of RES, from the perspective of a range of criteria. There is a trade-off between the technologies presented: some are complementary and others compete with and among a category. 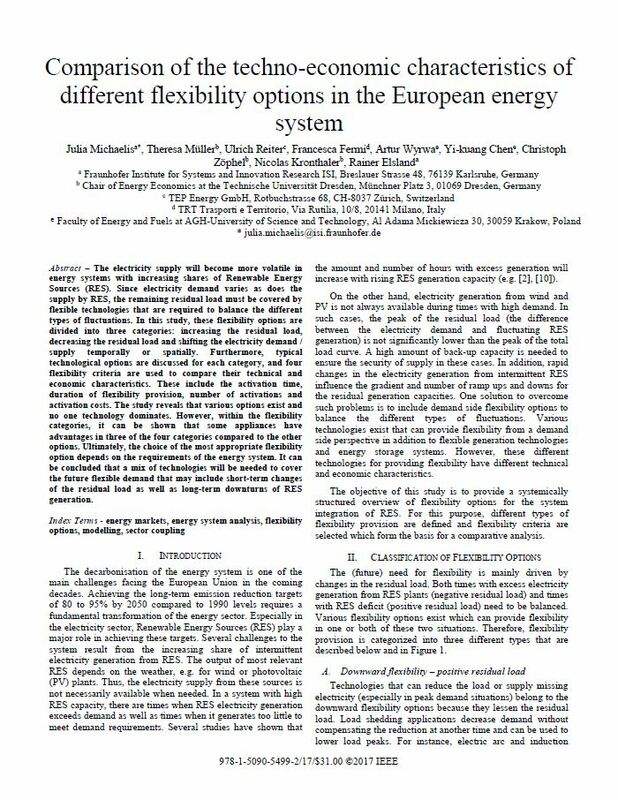 As an overall result, the analysis reveals that many different flexible technologies with varying characteristics will be potentially available in the future, and a variable mix of technologies will probably be used depending on the respective situation. Thus, it is not possible to choose one or a few flexibility options to cover the future need within this analysis. Very different challenging situations will occur that must be met by a mix of technologies. In the European Union a common understanding still exists that a future European energy system shall contribute to the EU climate policy aims. According to the Energy Roadmap of the European Commission, renewables are seen as the corner stone of any future energy system, of which solar and wind energy are known for their intermittent nature. The aim of this Policy Brief is to sketch the relevance of the future energy system design for the significance of different flexibility options. To clarify the options, two framework scenarios will be presented which account for socio-economic and socio-political uncertainties. This document focuses on selected experiences with capacity remuneration mechanisms that already have been implemented or will be introduced in the near future in several European countries (Belgium, France, Spain, Sweden and the UK). So far, the implementation yielded mixed experiences, hence making the designs subject to continuous modifications. As the introduction of national mechanisms can delay cross-border electricity trades and interfere with the process of an integrated European electricity market, a Europe-wide coordination is recommended. In recent years, electricity markets have been characterized by a growing share of fluctuating renewable energies, which has increased concerns about the security of electricity supply. As a consequence, existing market designs are adapted, and new capacity remuneration mechanisms are introduced. However, these mechanisms entail new challenges, and it is disputed whether they are indeed needed. In this article, an overview of the current debate on the necessity of capacity remuneration mechanisms is provided. Furthermore, initial experiences of real-world implementations are discussed, and common findings in the literature, categorized by their economic implications, are derived. Finally, shortcomings in existing research and open questions that need to be addressed in future works are pointed out. This study employs the ASTRA strategic system dynamics model to investigate the impact of electric bikes (e-bikes) on modal split in Europe at urban level. The resulting reduction of kilometers travelled by conventional internal combustion means of transports will consequently affect the amount of greenhouse emissions (GHG). 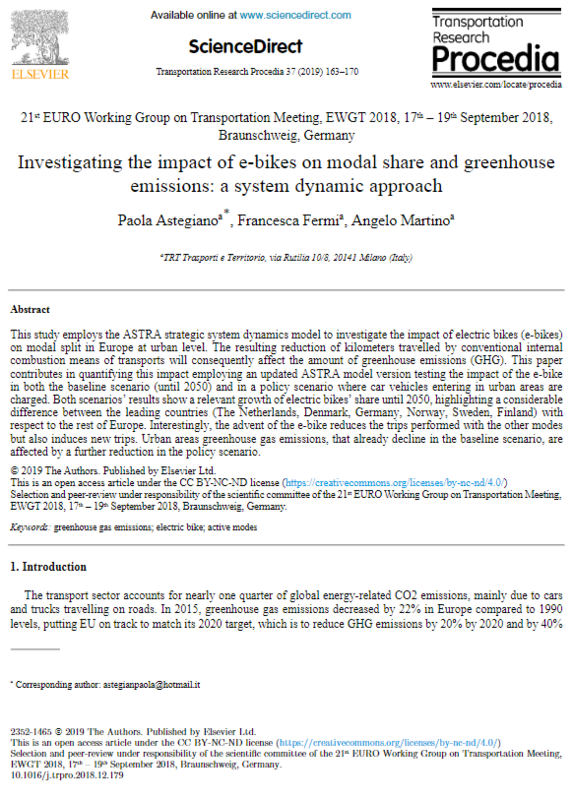 This paper contributes in quantifying this impact employing an updated ASTRA model version testing the impact of the e-bike in both the baseline scenario (until 2050) and in a policy scenario where car vehicles entering in urban areas are charged. Both scenarios’ results show a relevant growth of electric bikes’ share until 2050, highlighting a considerable difference between the leading countries (The Netherlands, Denmark, Germany, Norway, Sweden, Finland) with respect to the rest of Europe. Interestingly, the advent of the e-bike reduces the trips performed with the other modes but also induces new trips. Urban areas greenhouse gas emissions, that already decline in the baseline scenario, are affected by a further reduction in the policy scenario. Bottom-up energy models can support strategic decision-making and can help to manage an efficient transition to a low-carbon energy system. The manufacturing industry accounted for about 19% of EU-wide greenhouse gas emissions in 2014, which underlines the importance of this sector for model-based decarbonisation assessments. This paper describes the methodology of the FORECAST model. 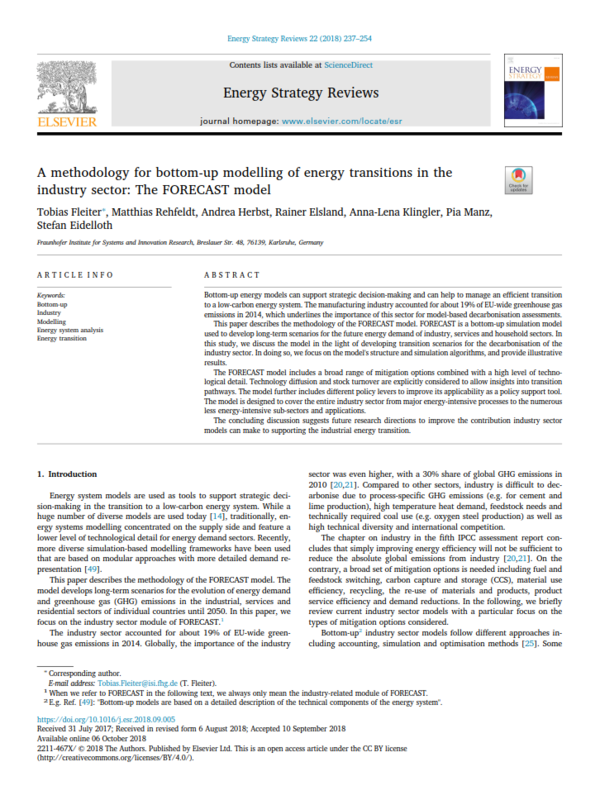 FORECAST is a bottom-up simulation model used to develop long-term scenarios for the future energy demand of industry, services and household sectors. In this study, we discuss the model in the light of developing transition scenarios for the decarbonisation of the industry sector. In doing so, we focus on the model’s structure and simulation algorithms, and provide illustrative results. The FORECAST model includes a broad range of mitigation options combined with a high level of technological detail. Technology diffusion and stock turnover are explicitly considered to allow insights into transition pathways. The model further includes different policy levers to improve its applicability as a policy support tool. The model is designed to cover the entire industry sector from major energy-intensive processes to the numerous less energy-intensive sub-sectors and applications. The concluding discussion suggests future research directions to improve the contribution industry sector models can make to supporting the industrial energy transition. Despite the many uncertainties about their profitability, it is apparent in many countries that a market for stationary batteries is developing. In this study, the market potential of PV þ battery systems is modelled up to 2040. The focus is on the effect of electric vehicles and heat pumps on the market potential of stationary batteries. The model uses 415 individual household consumption, heat pump and vehicle charging profiles to address differences in consumption behaviour. It was found that the increasing electricity consumption with the installation of heat pumps and electric vehicles generally increases the household’s profit from a self-consumption system. Further, the diffusion of electric vehicles can increase the market for stationary batteries by enabling consumers to charge their electric vehicles with self-produced PV power in the evening hours. Particularly so, if the heating loads can be scheduled for hours with PV production. Although the diffusion of electric vehicles and heat pumps significantly affects the market for stationary batteries, the share of households with these technologies remains relatively low in the short to medium term. Moreover, the market potential of PV þ battery systems for the purpose of self-consumption stands and falls with electricity and equipment prices. 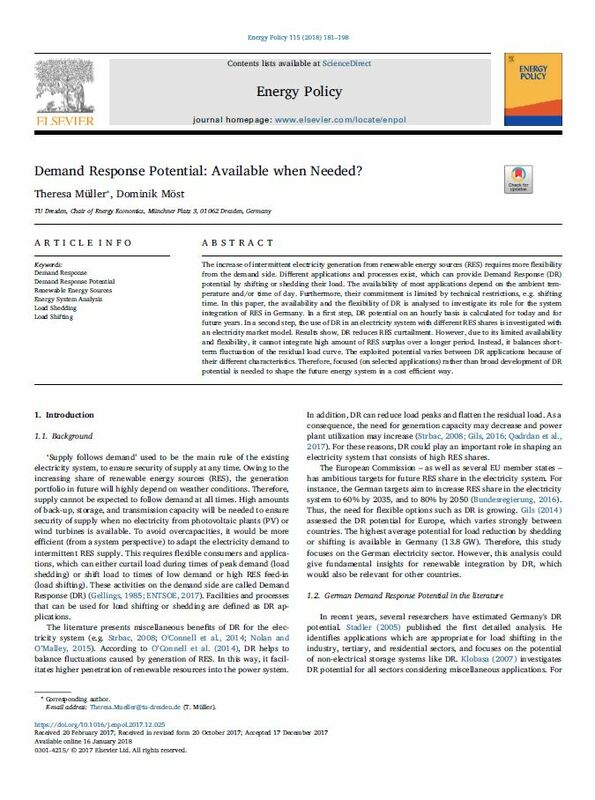 Demand Response Potential: Available when Needed? The increase of intermittent electricity generation from renewable energy sources (RES) requires more flexibility from the demand side. Different applications and processes exist, which can provide Demand Response (DR) potential by shifting or shedding their load. The availability of most applications depend on the ambient temperature and/or time of day. Furthermore, their commitment is limited by technical restrictions, e.g. shifting time. 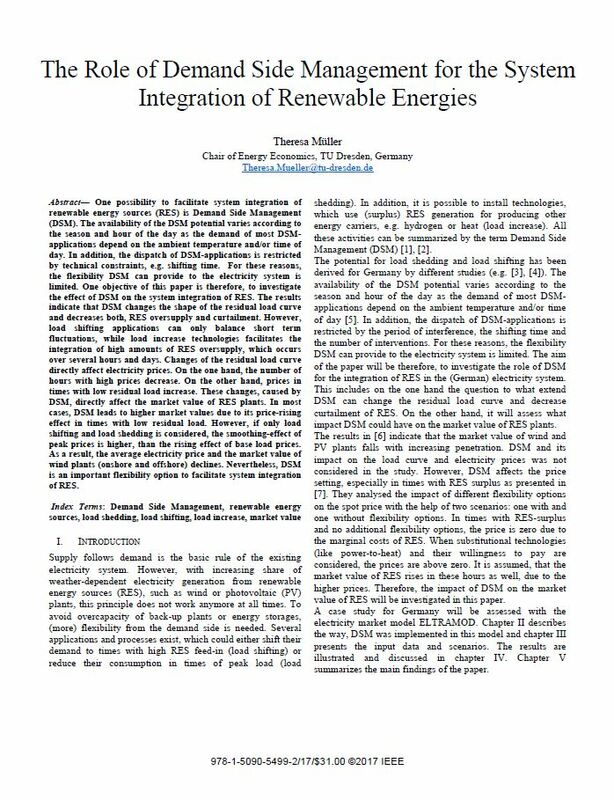 In this paper, the availability and the flexibility of DR is analysed to investigate its role for the system integration of RES in Germany. In a first step, DR potential on an hourly basis is calculated for today and for future years. In a second step, the use of DR in an electricity system with different RES shares is investigated with an electricity market model. Results show, DR reduces RES curtailment. However, due to its limited availability and flexibility, it cannot integrate high amount of RES surplus over a longer period. Instead, it balances short-term fluctuation of the residual load curve. The exploited potential varies between DR applications because of their different characteristics. Therefore, focused (on selected applications) rather than broad development of DR potential is needed to shape the future energy system in a cost efficient way. Which Flexibility Options Facilitate the Integration of Intermittent Renewable Energy Sources in Electricity Systems? In the last decade, the growing penetration of renewable energy sources has induced an increasing research interest in the analysis of flexible energy systems. In particular, the integration of intermittent renewable energy sources, as wind and photovoltaic energy, requires flexibility to compensate the imbalances between energy demand and supply. 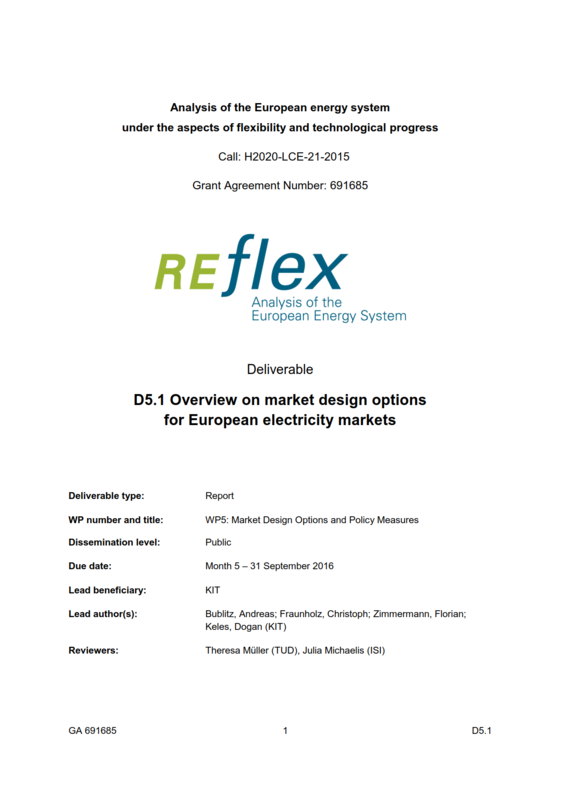 The objective of the paper is to provide a comprehensive literature review about the role of flexibility options in different electricity systems with focus on Europe and selected countries. 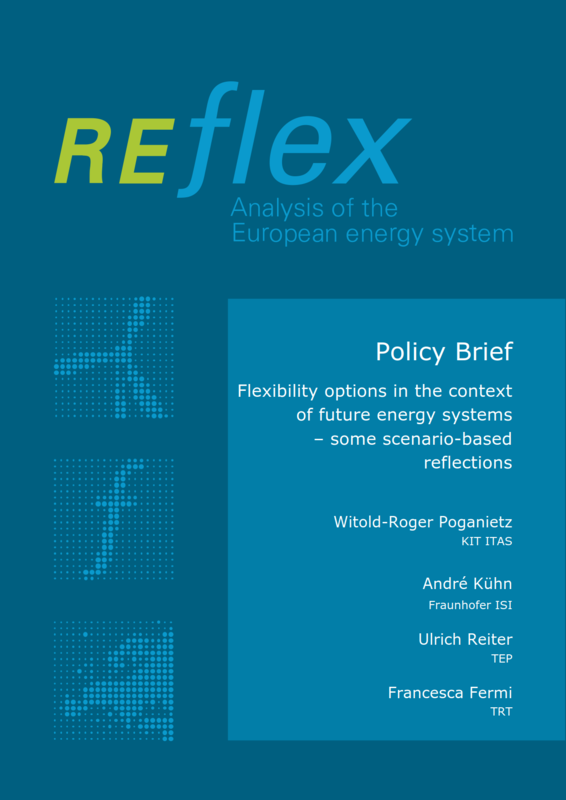 According to the present analysis, it can be pointed out that the portfolio of flexibility options and the interdependencies between them are based on the prevalent energy system in a country or region. 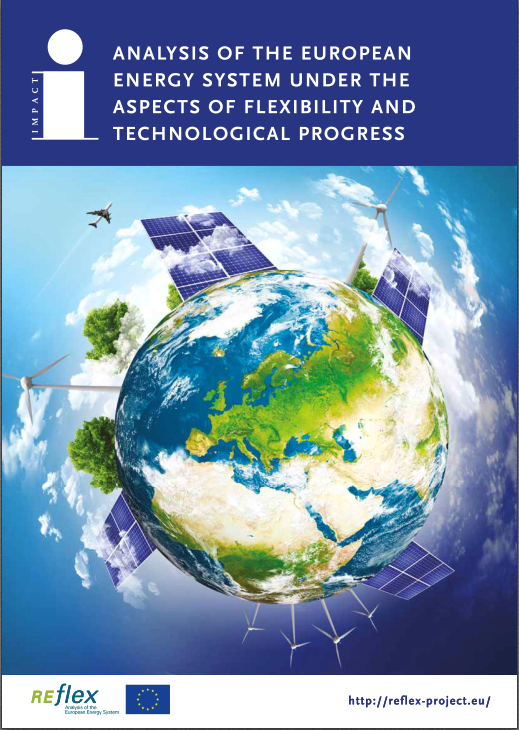 The research on flexibility measures is mainly driven by the observed energy system characteristics as well as the pursued climate protection strategy. Additionally, it is not possible to cover the prospective flexibility needs with one flexibility option. 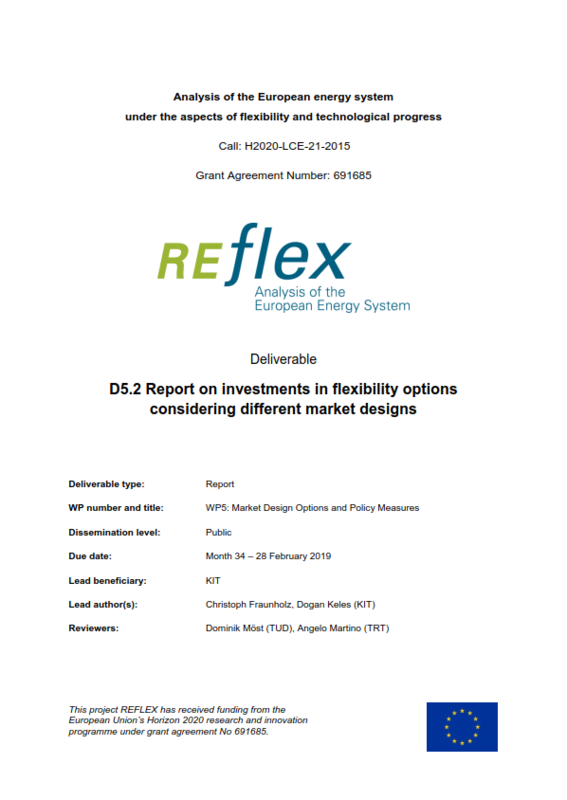 Moreover, the optimal portfolio of flexibility measures depends on the type of flexibility provision required, the cost effectiveness and whether the considered energy system is on a national or transnational level. 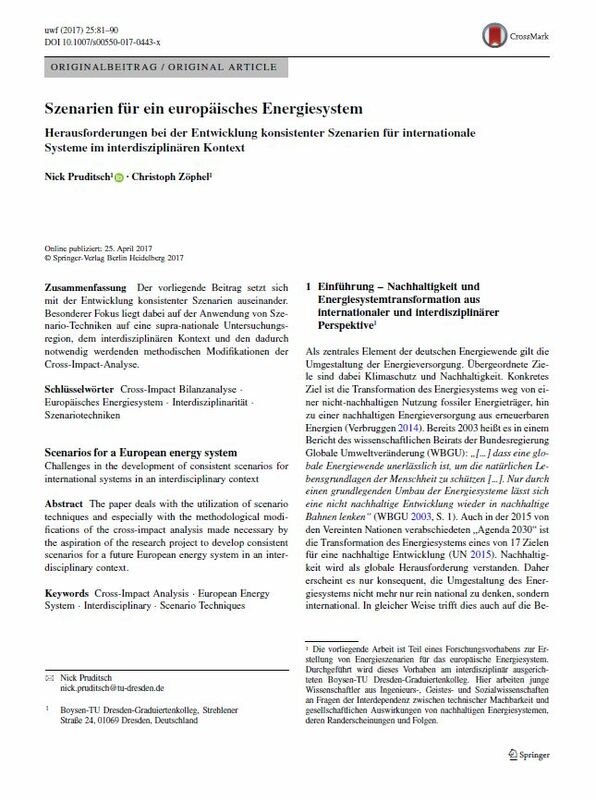 The paper deals with the utilization of scenario techniques and especially with the methodological modifications of the cross-impact analysis made necessary by the aspiration of the research project to develop consistent scenarios for a future European energy system in an interdisciplinary context. 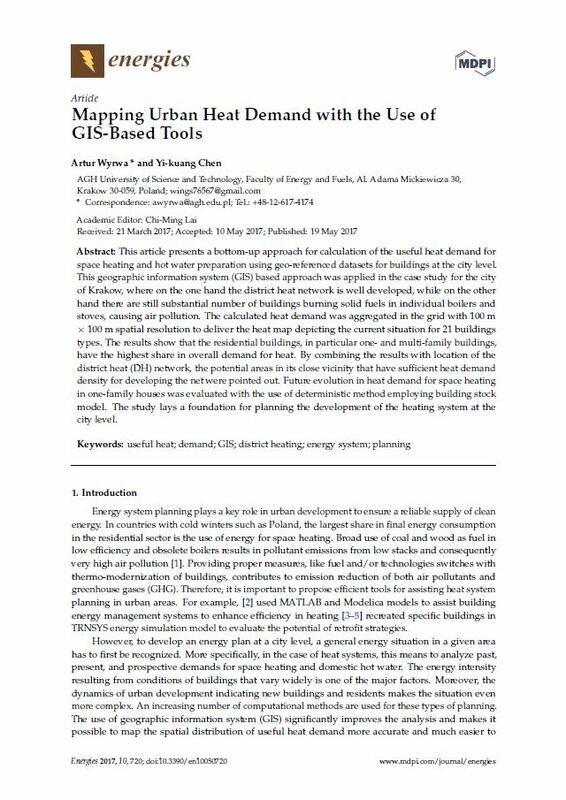 This article presents a bottom-up approach for calculation of the useful heat demand for space heating and hot water preparation using geo-referenced datasets for buildings at the city level. This geographic information system (GIS) based approach was applied in the case study for the city of Krakow, where on the one hand the district heat network is well developed, while on the other hand there are still substantial number of buildings burning solid fuels in individual boilers and stoves, causing air pollution. The calculated heat demand was aggregated in the grid with 100 m x 100 m spatial resolution to deliver the heat map depicting the current situation for 21 buildings types. The results show that the residential buildings, in particular one- and multi-family buildings, have the highest share in overall demand for heat. By combining the results with location of the district heat (DH) network, the potential areas in its close vicinity that have sufficient heat demand density for developing the net were pointed out. Future evolution in heat demand for space heating in one-family houses was evaluated with the use of deterministic method employing building stock model. The study lays a foundation for planning the development of the heating system at the city level. With rising shares of fluctuating renewable energy generation, the role of electricity storage becomes increasingly important. However, European pumped storage plants (PSPs) are currently confronted with economic challenges and their potential for smoothing the residual load curve is consequently not fully exploited. 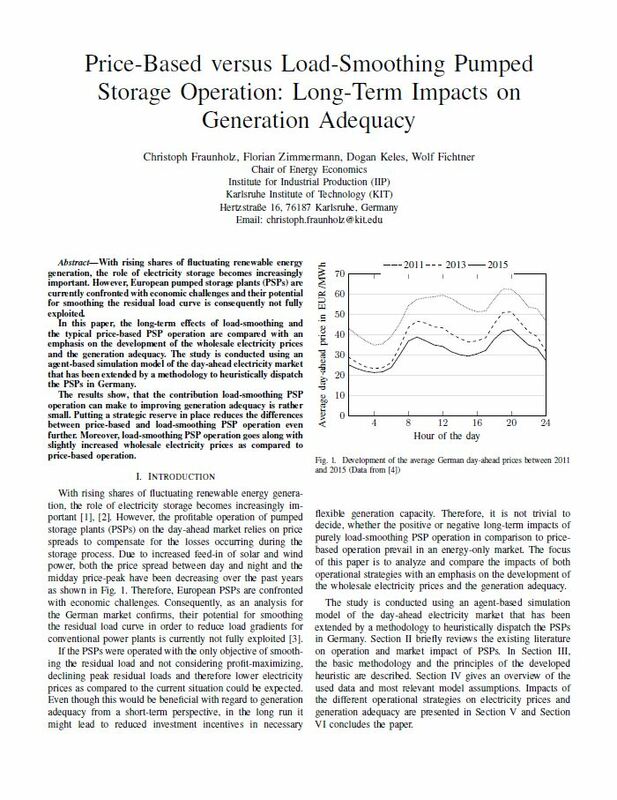 In this paper, the long-term effects of load-smoothing and the typical price-based PSP operation are compared with an emphasis on the development of the wholesale electricity prices and the generation adequacy. 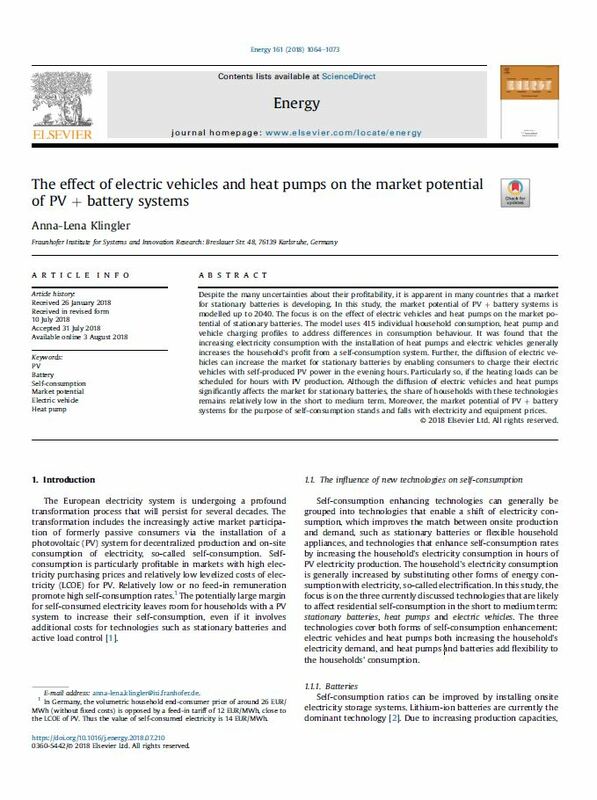 The study is conducted using an agent-based simulation model of the day-ahead electricity market that has been extended by a methodology to heuristically dispatch the PSPs in Germany. The results show, that the contribution load-smoothing PSP operation can make to improving generation adequacy is rather small. Putting a strategic reserve in place reduces the differences between price-based and load-smoothing PSP operation even further. Moreover, load-smoothing PSP operation goes along with slightly increased wholesale electricity prices as compared to price-based operation. 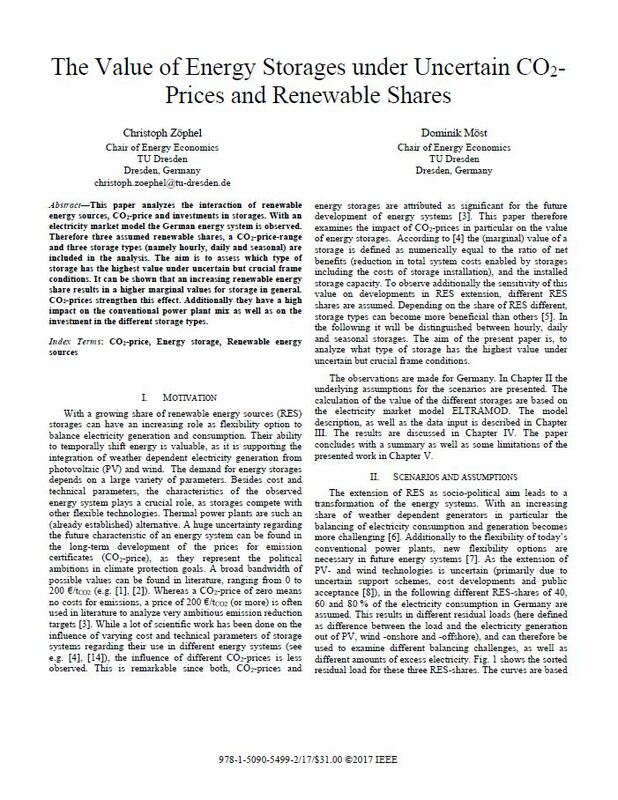 This paper analyzes the interaction of renewable energy sources, CO2-price and investments in storages. With an electricity market model the German energy system is observed. Therefore three assumed renewable shares, a CO2-price-range and three storage types (namely hourly, daily and seasonal) are included in the analysis. The aim is to assess which type of storage has the highest value under uncertain but crucial frame conditions. It can be shown that an increasing renewable energy share results in a higher marginal values for storage in general. CO2-prices strengthen this effect. Additionally they have a high impact on the conventional power plant mix as well as on the investment in the different storage types. One possibility to facilitate system integration of renewable energy sources (RES) is Demand Side Management (DSM). The availability of the DSM potential varies according to the season and hour of the day as the demand of most DSM applications depend on the ambient temperature and/or time of day. In addition, the dispatch of DSM-applications is restricted by technical constraints, e.g. shifting time. For these reasons, the flexibility DSM can provide to the electricity system is limited. One objective of this paper is therefore, to investigate the effect of DSM on the system integration of RES. The results indicate that DSM changes the shape of the residual load curve and decreases both, RES oversupply and curtailment. However, load shifting applications can only balance short term fluctuations, while load increase technologies facilitates the integration of high amounts of RES oversupply, which occurs over several hours and days. Changes of the residual load curve directly affect electricity prices. On the one hand, the number of hours with high prices decrease. On the other hand, prices in times with low residual load increase. These changes, caused by DSM, directly affect the market value of RES plants. In most cases, DSM leads to higher market values due to its price-rising effect in times with low residual load. However, if only load shifting and load shedding is considered, the smoothing-effect of peak prices is higher, than the rising effect of base load prices. As a result, the average electricity price and the market value of wind plants (onshore and offshore) declines. 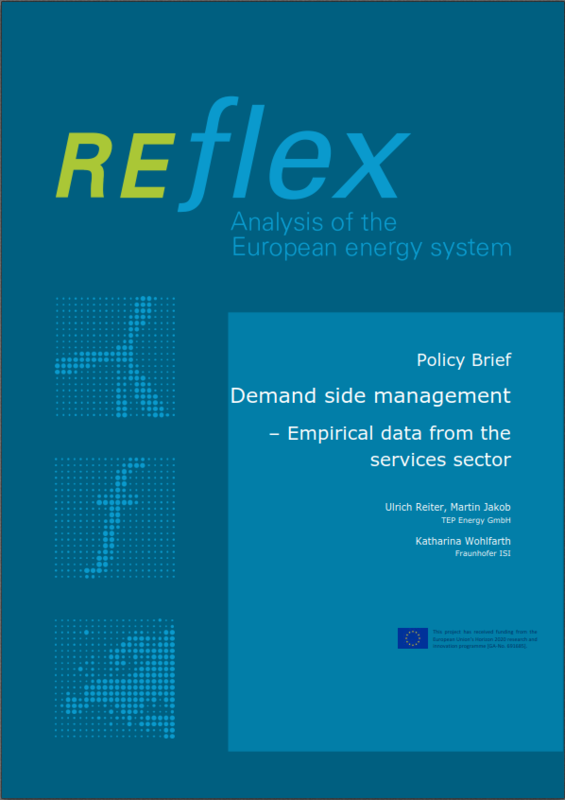 Nevertheless, DSM is an important flexibility option to facilitate system integration of RES. The electricity supply will become more volatile in energy systems with increasing shares of Renewable Energy Sources (RES). Since electricity demand varies as does the supply by RES, the remaining residual load must be covered by flexible technologies that are required to balance the different types of fluctuations. In this study, these flexibility options are divided into three categories: increasing the residual load, decreasing the residual load and shifting the electricity demand / supply temporally or spatially. Furthermore, typical technological options are discussed for each category, and four flexibility criteria are used to compare their technical and economic characteristics. These include the activation time, duration of flexibility provision, number of activations and activation costs. The study reveals that various options exist and no one technology dominates. However, within the flexibility categories, it can be shown that some appliances have advantages in three of the four categories compared to the other options. 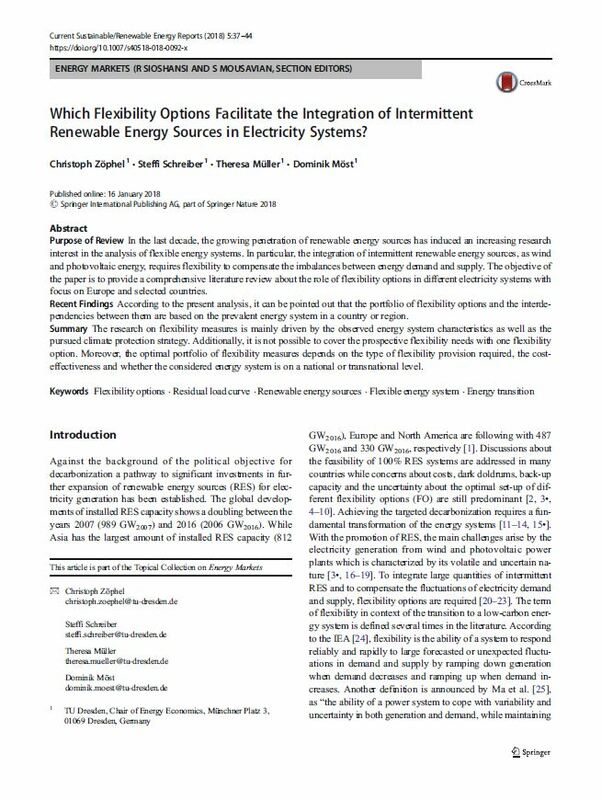 Ultimately, the choice of the most appropriate flexibility option depends on the requirements of the energy system. It can be concluded that a mix of technologies will be needed to cover the future flexible demand that may include short-term changes of the residual load as well as long-term downturns of RES generation. The future energy system is challenged by the intermittent nature of renewables and requires therefore several flexibility options. Still, the interaction between different options, the optimal portfolio and the impact on environment and society are unknown. 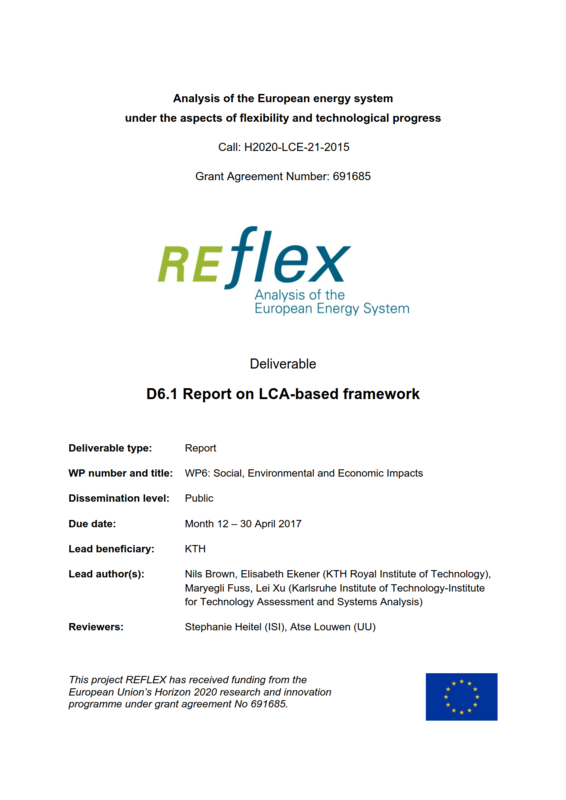 The core objective of REFLEX to analyse and evaluate the development towards a low-carbon energy system with focus on flexibility options in the EU to support the implementation of the SET-Plan. Transmission grid extension is a central aspect of the future energy system transition. This is due to the diverging occurrence of renewable energy feed-in and consumption. The existing layout of the German grid was not designed to accommodate this divergence. To analyze the most cost-effective grid extensions, efficient methods for techno-economic analysis are required. The challenge of conducting an analysis of grid extensions involves the lumpy investment decisions and the non-linear character of several restrictions in a real-data environment. The addition of new lines makes the grid characteristic variable for approximately load flow calculations. The following paper presents an application of the Benders Decomposition, dividing the problem into an extension and a dispatch problem combined with a Karush–Kuhn–Tucker-system. This combination enables one to solve the problem within reasonable time by using the favorable conditions contained in the sub-problem. 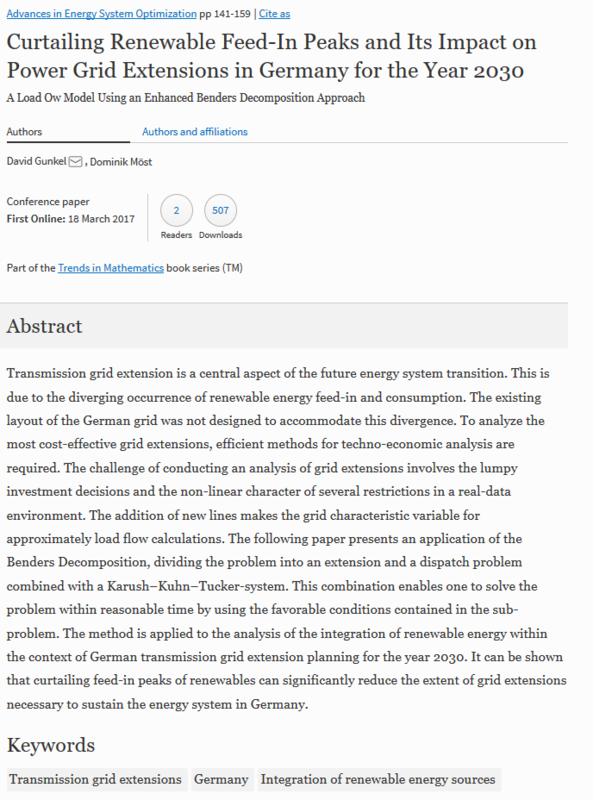 The method is applied to the analysis of the integration of renewable energy within the context of German transmission grid extension planning for the year 2030. It can be shown that curtailing feed-in peaks of renewables can significantly reduce the extent of grid extensions necessary to sustain the energy system in Germany. Um die fluktuierende Stromerzeugung durch hohe Anteile erneuerbarer Energien auszugleichen, werden zukünftig in großem Maßstab Speichertechnologien benötigt. In diesem Beitrag wird der am Markt beobachtbare Pumpspeichereinsatz einem simulierten lastglättenden Einsatz und einem simulierten preisbasierten Einsatz gegenübergestellt, um zu ermitteln, welche dieser beiden Strategien den realen Einsatz in Deutschland besser erklärt. Bei Betrachtung des über alle Tage des Simulationsjahres 2015 gemittelten stündlichen Einsatzes der deutschen Pumpspeicherkraftwerke zeigt sich, dass der simulierte preisbasierte Einsatz den generellen Verlauf des realen Einsatzes in allen Jahreszeiten gut nachbildet. Der lastglättende Einsatz übersteigt dagegen insbesondere in den Mittags- und Abendstunden im Sommer den realen Einsatz signifikant. 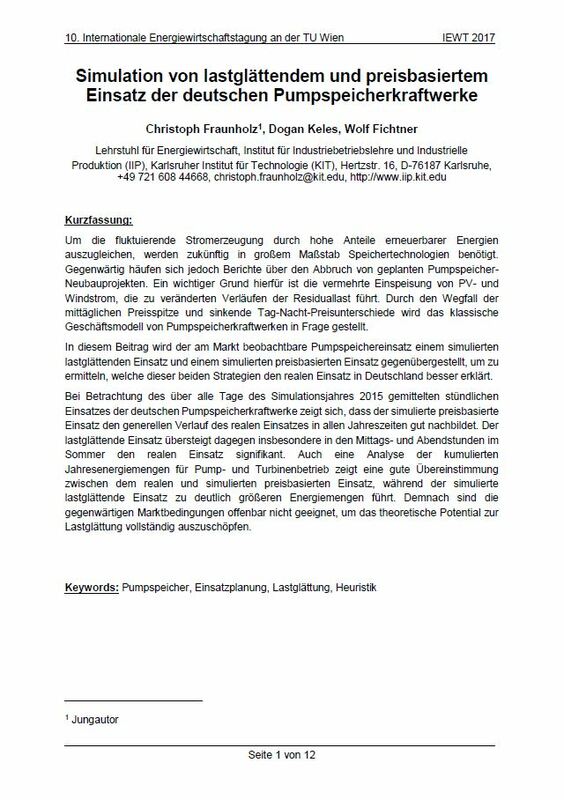 Auch eine Analyse der kumulierten Jahresenergiemengen für Pump- und Turbinenbetrieb zeigt eine gute Übereinstimmung zwischen dem realen und simulierten preisbasierten Einsatz, während der simulierte lastglättende Einsatz zu deutlich größeren Energiemengen führt. Demnach sind die gegenwärtigen Marktbedingungen offenbar nicht geeignet, um das theoretische Potential zur Lastglättung vollständig auszuschöpfen. Electricity markets are currently going through a phase of agitating transition, which is mainly characterized by an increasing share of fluctuating renewable energies. Among policy makers, this has led to growing concerns about generation adequacy and often to the introduction of different capacity remuneration mechanisms to generate less volatile sources of income for investors and, thereby, guaranteeing generation adequacy. However, these mechanisms entail new challenges regarding the best design to avoid any adverse effects. 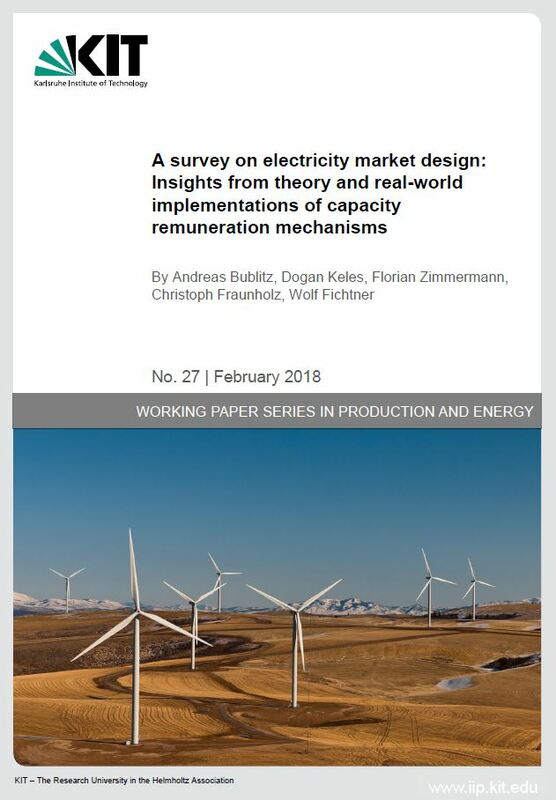 At the same time, it is disputed whether capacity remuneration mechanisms are indeed needed or whether an energy-only market is sufficient. Therefore, after discussing the peculiarities of the electricity markets, which are the starting point of the unique regulatory framework, an up-to-date overview of the debate on the need for capacity remuneration mechanisms is provided. In addition, the current status of capacity remuneration mechanisms in Europe is shown, and initial experience is presented. Furthermore, this article reflects the current state of research about capacity remuneration mechanisms in regards to, for example, cross-border effects, investment cycles or market power. In a conclusive summary, shortcomings of the existing research works and open questions that need to be addressed in future works are discussed. Professor Dominik Möst from Technische Universität Dresden is coordinating REFLEX. He talks about the expected impact from the project and sharing the knowledge gained. The Impact of Auctioning in the EU ETS: Are Utilities Still Profiting? 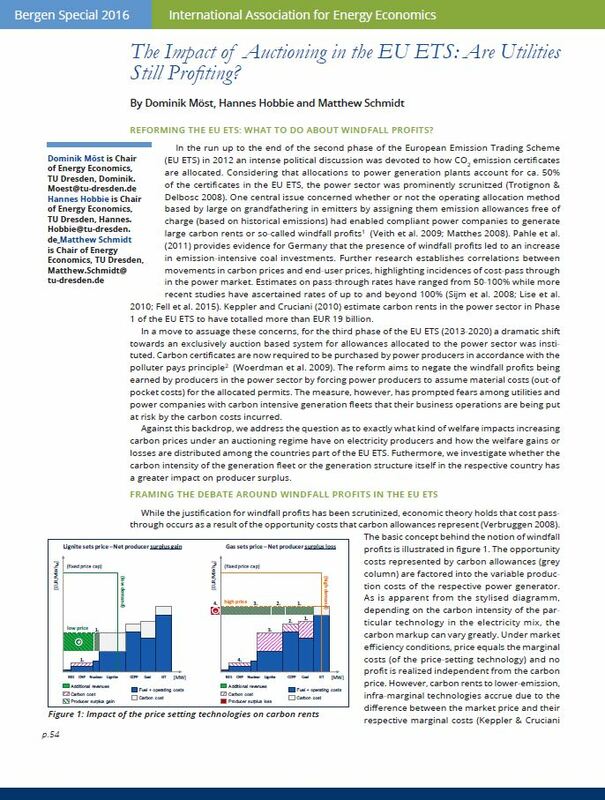 In the run up to the end of the second phase of the European Emission Trading Scheme (EU ETS) in 2012 an intense political discussion was devoted to how CO2 emission certificates are allocated. Considering that allocations to power generation plants account for ca. 50% of the certificates in the EU ETS, the power sector was prominently scrunitzed (Trotignon & Delbosc 2008). One central issue concerned whether or not the operating allocation method based by large on grandfathering in emitters by assigning them emission allowances free of charge (based on historical emissions) had enabled compliant power companies to generate large carbon rents or so-called windfall profits (Veith et al. 2009; Matthes 2008). * Further research establishes correlations between movements in carbon prices and end-user prices, highlighting incidences of cost-pass through in the power market. We address the question as to exactly what kind of welfare impacts increasing carbon prices under an auctioning regime have on electricity producers and how the welfare gains or losses are distributed among the countries part of the EU ETS. Furthermore, we investigate whether the carbon intensity of the generation fleet or the generation structure itself in the respective country has a greater impact on producer surplus. 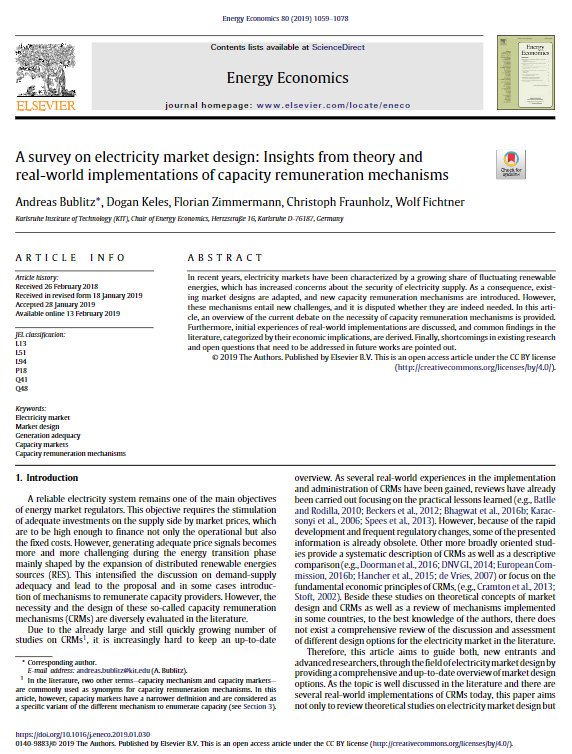 Against the background of several European countries already using or currently considering the implementation of a capacity remuneration mechanism (CRM) as an extension to the energy-only market (EOM), this report provides a quantitative assessment of the long-term cross-border effects of CRMs in the European electricity system. The aim of this work is to develop a coherent and transparent methodological framework to guide and codify the application of social environmental life cycle assessment (eLCA and sLCA) specifically for assessing future energy systems as projected by energy systems modelling (ESMs). 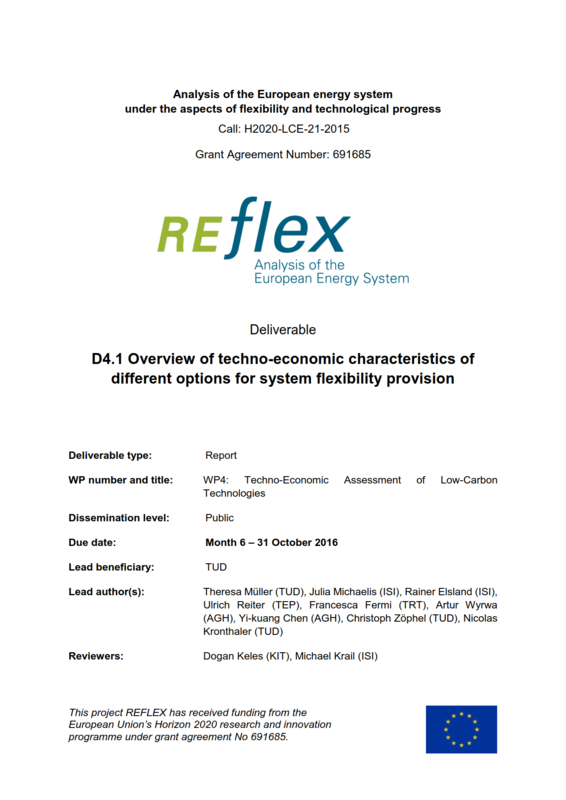 This document provides a structured overview on flexibility options for system integration of RES, compared under different criteria. 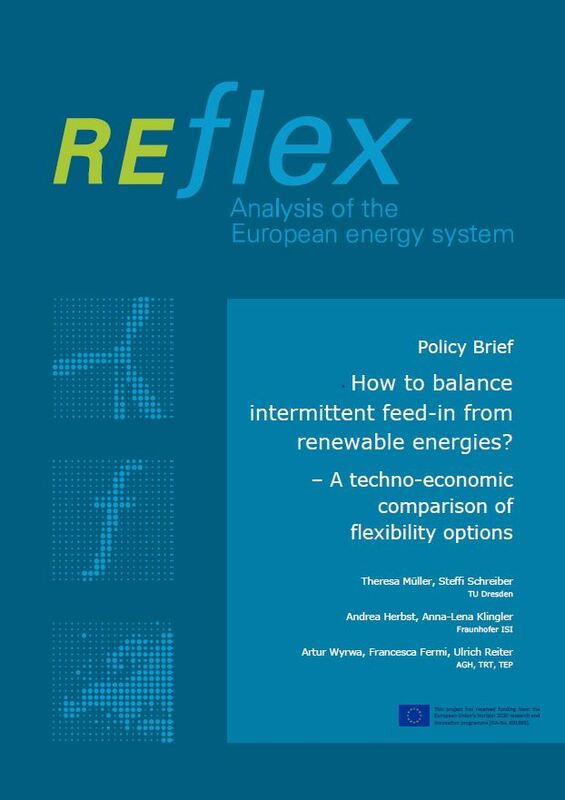 The way of flexibility provision has been categorized in three different types: downward-flexibility (reducing or supplying the positive residual load), upward-flexibility (reducing excess feed-in of renewable energy sources) and shifting-flexibility (spatial or temporal shifting). 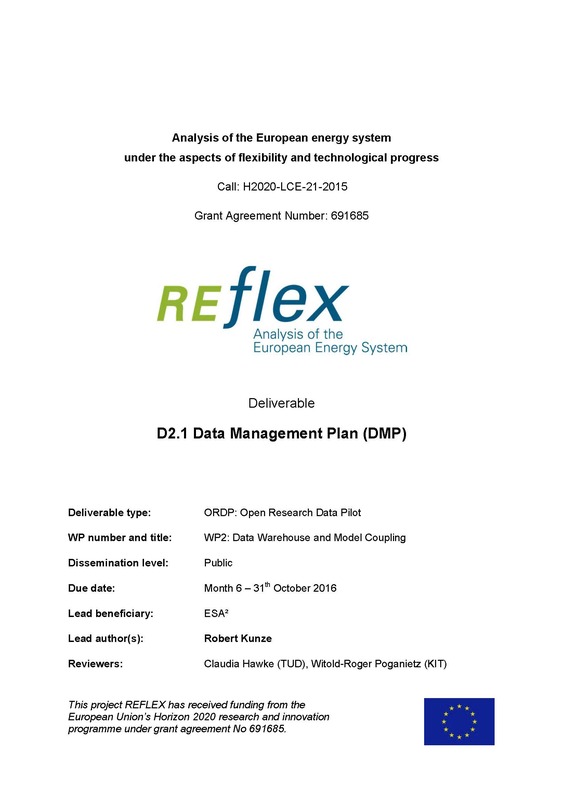 This document provides the draft version of the Data Management Plan (DMP) for the REFLEX project according to the Open Research Data Pilot (ORD pilot) under Horizon 2020. The purpose of the DMP is to support the data management life cycle of all data that will be collected, processed or generated by the project. As concerns about generation adequacy are currently rising in Europe, decision makers try to incentivize investments in generating capacities and demand response measures. This document provides an up-to-date overview on currently implemented and proposed market design options in- and outside Europe. 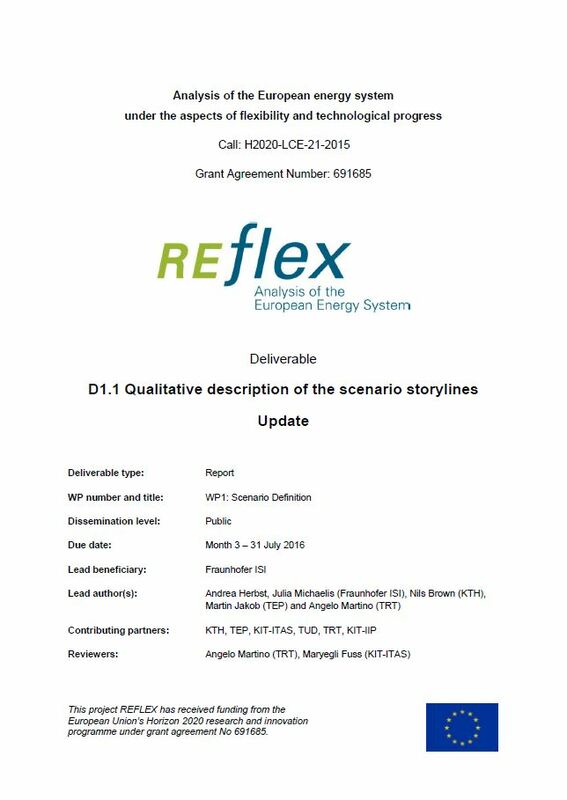 This document has the objective to present the draft qualitative description of the scenario storylines for the REFLEX project. This scenario description provides the overall qualitative framework for the modelling activities in all other Work Packages by setting-up two holistic socio-technical scenarios based on different scenario storylines. That includes the definition of the main framework parameters and a draft of the societal and political environment. The newsletter provides information about REFLEX events, publications and major outcomes to interested stakeholders. Subscribe/Unsubscribe the newsletter.